A discussion about global freedom of artistic expression. Special guest panel including members of the film, Ukrainian, and human rights advocacy communities of Edmonton. Tickets available by donaton. All proceeds will go directly to support Oleg Sentsov and his family. 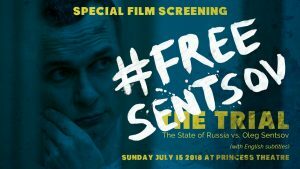 Oleg Sentsov is a Ukrainian Filmmaker, Euromaidan activist and native of Crimea. 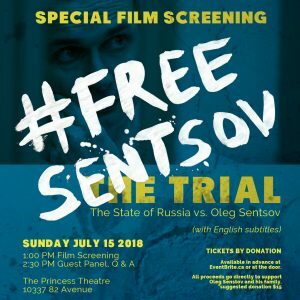 Sentsov first came to the attention of the international film world when he triumphed with his film Gaamer (Gamer) at the 2012 Rotterdam Film Festival. 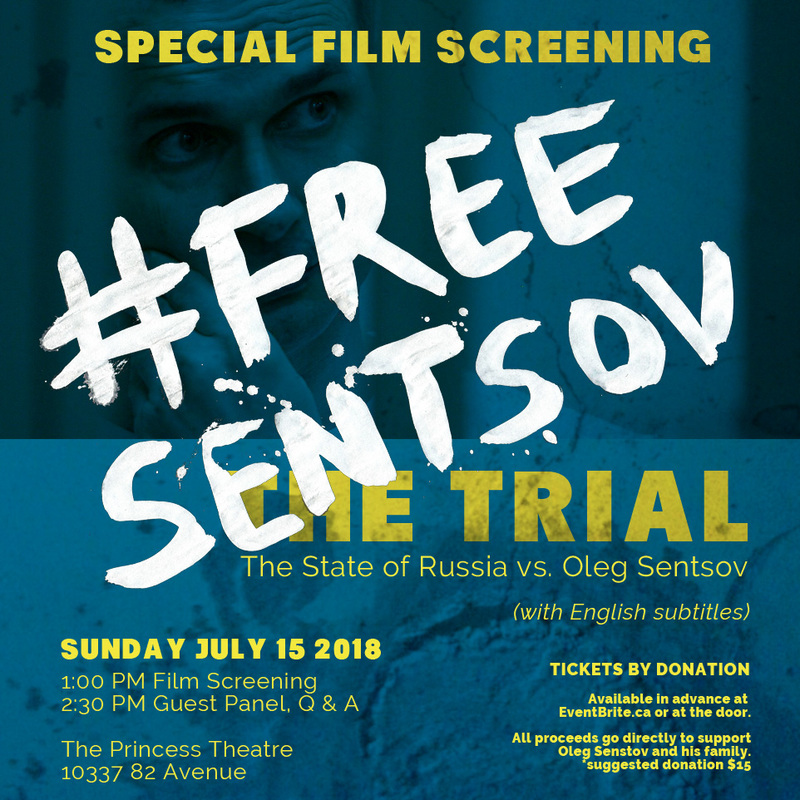 In a horrific Kafka-esque story of torture, state-sponsored cruelty, cowardice and redemption, Director Askold Kurov follows Sentsov’s ensnarement in a mis-managed Secret Police investigation, his refusal to succumb to torture and his defiance in the face of a ruthless state police apparatus bent on crushing free speech and political opposition. Director Askold Kurov follows the progress of the trial and the attempts of Oleg’s family, friends and lawyers to obtain justice and save him from prison. The notorious case inspired protests around the world: the European Film Academy and many renowned filmmakers such as Pedro Almodovar, Wim Wenders, Agnieszka Holland, Ken Loach, Johnny Depp and others called for Oleg’s release. We believe the issues discussed in this film are important not only to Ukrainians, but to the world. Russia’s actions threaten the freedom of our global community, and Canadians need to be aware. Please share this event with your friends, family, and community. THANK YOU AND WE LOOK FORWARD TO SHARING THIS IMPORTANT EVENT WITH YOU. Ukrainian Canadian Professional and Business Association of Edmonton.